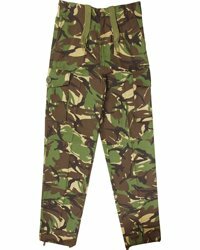 New, polyester-cotton, padded, water repellent children's DPM camo combat trousers. 65% polyester, 35% cotton, Six Pockets, adjustable buckle waist straps, Bottom hem drawcords. Size options missing from the dropdown list indicates a temporary lack of stock. Please call back later. The UK delivery charge if you buy one of these items is £3.87.